I've blogged about my previous participation in Seattle's Tax Day Tea Parties, both in 2009 and 2010. I also know that I'm just one person and a single Tea Partier of millions across this great nation; among the many blogs on the Internet, I am a 1-in-100 blogger. Previously I wrote about my approval of Dino Rossi, and now I'd like to present a Washington State Tea Partier approved list of legislation on the voter ballot for November 2, 1020. What's the most important piece of legislation on the ballot this November? The progressive agenda, SEIU thugs and other local labor unions have been trying this one for years: get Washington voters to approve a statewide Income Tax. This time, they're trying to trick voters into believing the income tax will only be enforced "on the wealthy." It sounds a lot like that socialist, 'spread the wealth around' legislation President Obama keeps talking about. The problem is that in two years all it will take is a simple majority to increase this income tax to all workers living in Washington, regardless of how much money you earn. 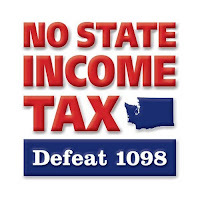 Washington state has had a Democratic Supermajority for over 10 years, so every voter can count on their own income getting taxed in two years if 1098 passes. Any tax decreases promised in replacement of an income tax will all rise again, which is a consistent theme under Democratic control. Defeating 1098 is my #1 hope-to-see result coming out of the November 2010 elections. This and a Dino Rossi win, of course. My next approved vote is a Yes on 1107 - but why, you may ask? I support a yes vote because 1107 repeals the costly and arbitrary new tax hikes on thousands of common food and beverage products. The problem isn’t that taxes are too low; it’s that spending is too high. Lastly, this Washington state Tea Partier approves a Yes to 1100 vote - but why, you may ask? Initiative 1100 ends the Prohibition-era state monopoly on liquor sales, ends price gouging (the current 51.9 percent markup on all liquor), allows the competition of the private sector to bring lower prices, and brings more choice and convenience to the consumer as well as creates private jobs while reducing taxpayer costly state workers.